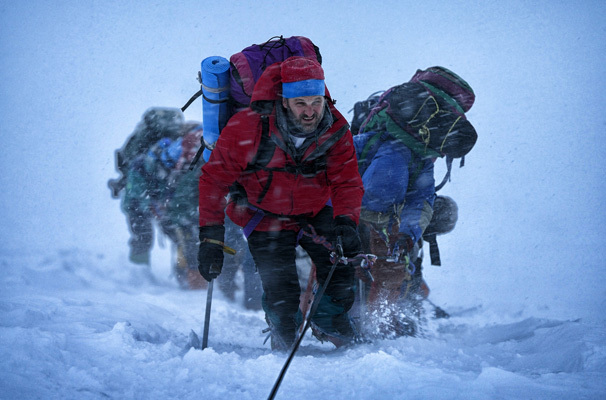 Capturing the awe and terror of the world’s highest mountain with heart-stopping intensity, Icelandic director Baltasar Kormákur’s Everest puts us in the crampons of the climbers caught up in the 1996 Mount Everest disaster, already the inspiration for a blizzard of books, documentaries and a made-for-TV movie. Kormákur’s is a sober, resolutely unsentimental account of the tragedy but remains utterly gripping – even if you have prior knowledge of the fates of the two rival expeditions on which it focuses, Adventure Consultants, led by ruggedly dependable New Zealander Rob Hall, and Mountain Madness, led by laid-back maverick American Scott Fischer (Jake Gyllenhaal). Their clients are another study in contrasts and include brash Texan millionaire Beck Weathers (Josh Brolin), diffident postman Doug (John Hawkes) and tenacious author Jon Krakauer (House of Cards’ Michael Kelly), whose book Into Thin Air was the basis for the 1997 ABC TV movie. 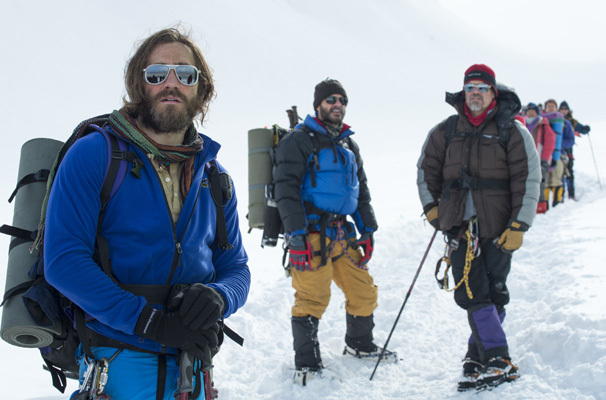 Everest conveys the climbers’ ordeal on the mountain’s treacherous slopes with bone-chilling immediacy. And what they go through is truly harrowing – trapped by a blizzard in the Death Zone, the zone above 26,000ft where the thin air contains one-third of the oxygen found at sea level, and left to battle hypothermia, hypoxia, frostbite and other perils. The emphasis here is very much on the mountaineers’ visceral experience rather than a forensic analysis of what went wrong, but the film drops enough clues along the way for us to get an idea of the tragedy’s causes – too many climbers on the mountain, fatal bottlenecks, hubris and flawed decisions among them. One peril the filmmakers avoid is that of making the story excessively melodramatic. Kormákur and his screenwriters (William Nicholson and Simon Beaufoy) steer well clear of disaster movie clichés but manage to deepen our involvement with the film’s protagonists by cutting away from the mountain to show us those people aware of the unfolding calamity but powerless to intervene. And our hearts are in our mouths along with helpless base camp manager Helen Wilton (Emily Watson), mission doctor Caroline Mackenzie (Elizabeth Debicki, The Man from Uncle), Hall’s pregnant wife Jan Arnold (Keira Knightley) and Weathers’ no-nonsense spouse Peach (a near-unrecognisable Robin Wright). 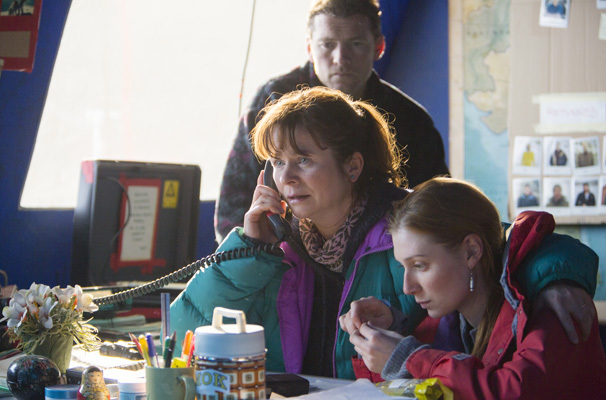 The fact that, as in real life, Hall is in touch by phone with Helen and Jan as he struggles to survive makes his fate even more heartrending. Casting the bluff, broad-shouldered Clarke as the steadfast Hall is another coup and an example of the film’s astute strategy of choosing second-tier stars rather the distracting likes of a Tom Cruise or Brad Pitt to fill the major roles. Instead, the mountain is the star. It looks awesome, too, with footage shot in the Himalayas and the Dolomites spliced together to create a convincing composite, its terrifying grandeur all the more impressive on an Imax screen in 3D. And, as the wind whips and howls around the summit, you really do feel you are there on the mountain – and desperately thankful that you aren’t. Certificate 12A. Runtime 121 mins. Director Baltasar Kormákur.